Running can be a great weight loss tool – here’s how to do it the healthiest way. 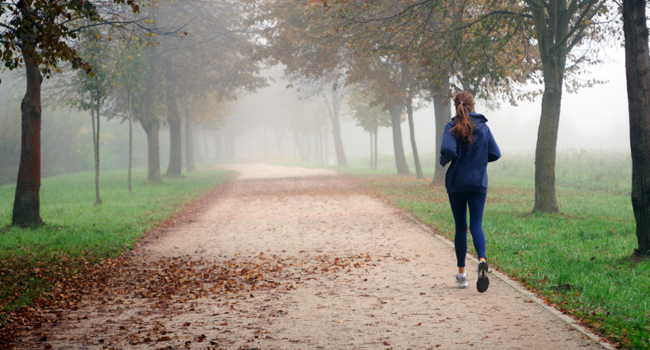 Running should be the easiest way to lose weight and keep it off. So why does unwanted weight gain happen even when you do all the right things: up your mileage, train regularly, eat right? The truth is, you could be missing out on one or more of these 9 fundamental weight loss rules for female runners. Get them right, and it will be much easier to manage your weight, enjoy running, and stay healthy whilst you do it. And yes, that still applies if you’re menopausal or coming back from pregnancy. This is the fundamental fact of weight management: to lose weight, you need to create a caloric deficit. That means creating a gap between how much energy you take in (through food and drink) and how much you expend (through running, every day life, and simply being alive). Make a good start by Googling your BMR (basal metabolic rate) then TDEE (total daily energy expenditure). That’s a reasonable guess at your daily calorie needs. Now make sure you eat to those needs. Eat the same to keep your weight the same, or eat slightly less to create that gap and lose weight. Don’t set an arbitrary weight goal (like “10 stone”). Be realistic for your height, shape, size, and structure. Think in terms of health, energy levels, mood, and running performance – not a number on the scale. Every women has a different ‘healthiest’ weight. Be realistic about yours. Dieting to lose body fat does not mean being miserable and starving around the clock. You need to fuel and nourish your body (especially if you want to run!) Just eat a little less in terms of energy. Fill up on healthy, high volume foods like vegetables, salads, lean protein, grains, and fruits. Don’t waste your calories on foods dense in energy and low in nutrients. Always think how you can get the most bang for your buck within your calories. Running is a great calorie burner, but don’t think it’s all you need to do. Vary the ways in which you expend calories – your body will thank you for it. Go for long walks, cross train with swimming or cycling. And do some form of strength training. That doesn’t have to mean weights – it could be bodyweight exercises or circuits. But working on muscles as well as cardio will help you lose weight and tone up. That said, you can use running to your advantage when you want to lose weight. Both long runs, and intense runs, can help you burn calories. Extend your long run by around 10% every week (you could run further, but you risk overdoing it or inviting injury). For every mile you run, you’ll burn around 70-100 calories. The more miles you run, the more calories you burn. Just make sure you balance running with recovery. The other way to use running as a fat loss tool is to up the intensity. Intervals, sprints, hill reps, track sessions, fartlek, and tempo runs are great examples of how to run faster and harder to kickstart weight loss. Combine intense work periods with easier recovery periods so you can really work hard. Add 1-2 intensity sessions per week to your regular training (replacing other sessions). Trying to go it alone can be difficult. Add some official accountability and you may find you lose more weight, more quickly, more easily. This can mean a running buddy, a healthy eating friend, a Personal Trainer or coach. Accountability makes things more real, focusing your mind and helping you carry out the daily habits that will lead to results. #8 What Type Of Food Diary? Keeping a log of what you eat will help you stick to the correct amount of calories. But there are lots of ways to do it. You could use an app like myfitnesspal, or an old school pen and paper food log. Or how about this visual idea: simply take a photo of everything you eat or drink. It’s very easy to forget things, or underestimate portion sizes. Being able to look back and see the food exactly as it was will help you see where to scale back or make better choices. #9 Weight, Size, Or Shape? Maybe you shouldn’t aim for weight loss at all. Perhaps a different shape (smaller waist?) or dress size would be healthier. Scale weight means very little without also knowing your health markers, like how much body fat you are carrying (including the fat around your organs). Lose weight to improve your cholesterol, blood pressure, fitness, and how you feel.